LAST month, Meraas, Caesars Bluewaters Dubai and multi-Michelin-starred chef Gordon Ramsay put on a spectacular show for the launch of Caesars Bluewaters Dubai. Introducing the first non-gaming resort from the legendary Caesars Entertainment brand, the evening also marked the sizzling debut of the second global outpost of Gordon Ramsay Hell’s Kitchen. 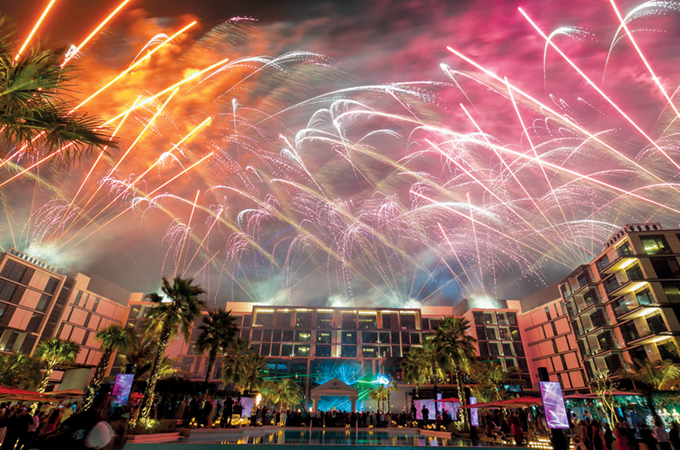 The successful, glitzy grand launch was hosted by the multi-Michelin-starred chef and members of Las Vegas’ Caesars Entertainment team including executive vice president and chief marketing officer, Chris Holdren and concluded with an incandescent firework display. Located on Bluewaters, Meraas’ sophisticated modern, family-oriented island destination, Caesars Bluewaters Dubai will be surrounded by nearly 150 retail, dining and entertainment outlets. And standing at over 250 metres on the edge of the island is the world’s largest observation wheel, Ain Dubai, which serves as a spectacular focal point and can be seen from both hotels and the residences. Bluewaters is easily located from the mainland with a new pedestrian bridge spreading out over the crystal waters of the Arabian Gulf leading directly from The Beach to the island. Bringing the world-famous ‘Caesars’ ambiance across two unique resort offerings, Caesars Bluewaters Dubai introduces Dubai to a fun approach to luxury. Caesars Palace Bluewaters Dubai is a 194-guest room resort, featuring a stylish beach club, Cove Beach and world-class restaurants including Pan-Asian Zhen Wei, The Piazza serving bespoke afternoon tea, poolside light bites at Neptune as well as the second-ever Gordon Ramsay Hell’s Kitchen, a joint venture between Gordon Ramsay and Caesars Entertainment in conjunction with ITV America.